Published: July 28, 2017 at 11:55 a.m. 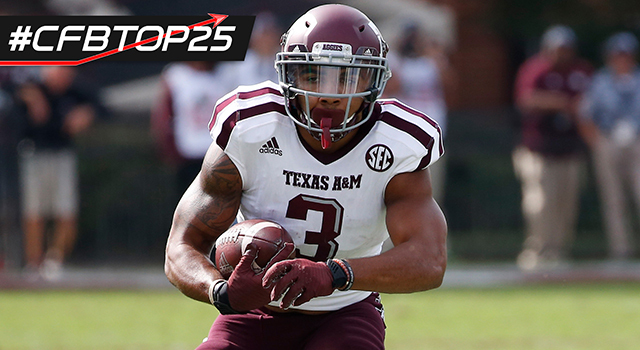 Updated: July 31, 2017 at 01:15 p.m.
Texas A&M's Christian Kirk burst onto the scene as a playmaker during his freshman year in 2015, and he enters this season as the Aggies' biggest star after solidifying his standing as a versatile weapon in 2016. The 5-foot-11, 200-pound junior led the SEC with 83 catches last season, becoming the first Texas A&M player to make 80 or more catches in consecutive seasons. He's also the NCAA's active leader in career punt return average (23.1) and punt returns for touchdowns (he's taken back five of the 27 punts he's fielded for scores). Kirk projects as a slot receiver at the next level and could do plenty of damage in the role given the potential he's shown in his first two seasons. Kirk received votes from four of seven CFB 24/7 experts, with a high of No. 11 in one analyst's rankings. Only one receiver is ahead of him in the #CFBTop25 countdown. He also has the attention of selection committees for CFB awards, as he was selected to the watch lists for the Maxwell (top player) Biletnikoff (top WR) and Hornung (most versatile player) awards. Where do fans rank Kirk? We asked Twitter users who they considered the best player in college football. Kirk didn't receive a vote, which is a bit surprising given that he's one of the most heralded players at a skill position and plays for a high-profile program.